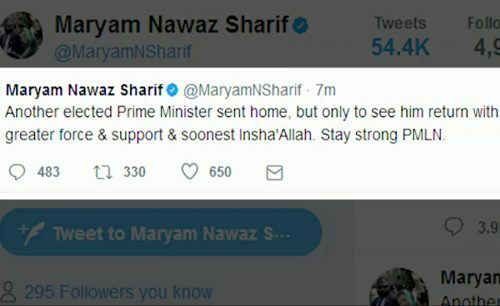 ISLAMABAD (92 News) – Maryam Nawaz Sharif, daughter of former prime minister Nawaz Sharif has on Friday said that another elected prime minister has been sent home. The daughter of former PM said that today will pave the way for Nawaz Sharif’s resounding victory in 2018 general elections, adding that he will be unstoppable. Insha’Allah. Rok sakte ho to rok lo! (Stop if you can). Maryam Nawaz said that the Pakistan Muslim League-Nawaz (PML-N) stands united, more resolute and unfazed. That’s also unprecedented.